I used to think of the saying holding on for dear life as part of a carnival ride, like the tilt-a-whirl, or tilt-a-hurl as I’ve come to know it as an adult. 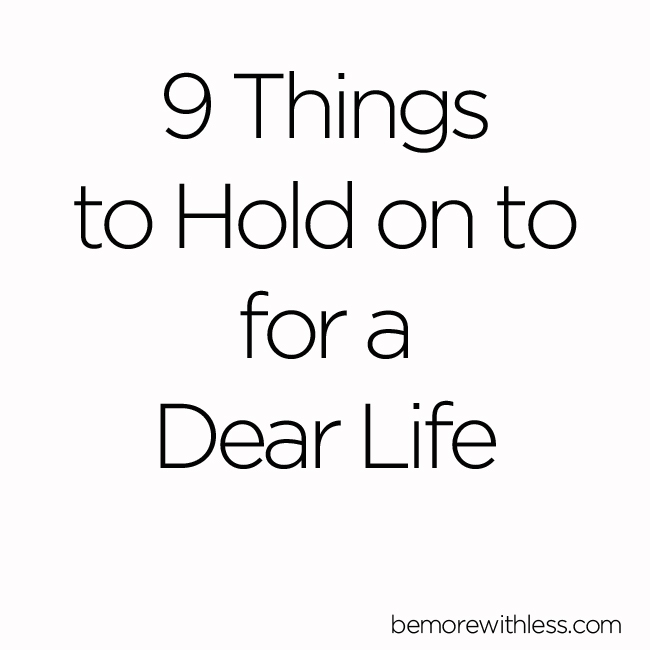 Holding on for dear life can also be our reaction when life falls apart, and we desperately need something solid to grab while we weather the storm, so we don’t fall apart too. Recently I’ve redefined the phrase and realized there are a few things we can hold on to so we can create a dear life. These are the things that help us rise, and give us the comfort and confidence we need to weather any storm. Even though everything changes and nothing is permanent, I’d like to make a case for holding on. Let go of the stuff that weighs you down like clutter, guilt, fear, and anger, but hold on to what matters. Spend time everyday lifting yourself up with nourishing food, movement, sleep, and anything you need to support a healthy heart, mind, body, and soul. Schedule a massage, yoga class, or long walk as if it were as important as anything else on your calendar, because it is. Your innovative ideas may sound crazy to others, and sometimes even to you, but hold on to them. Be curious and experiment. Test your ideas and share them with others. Give them room to expand and grow in directions you may not have considered at the beginning. The only thing that is certain, is that nothing is certain. Be open to change, adapt to new situations and hold on to your ability to see the good in things. Notice the blessings even when you aren’t sure how things will turn out, or if they didn’t turn out as you had hoped. The blessings are always there, but when we hold on to our fear of change, or the disappointment when our expectations aren’t met, we miss them. We have a gift for holding on to the past and for punishing ourselves or other people we love for things that have already happened. Then, we have a go at the future and hold on to our expectations of how things should be, and our fears about what may be. Instead, hold on to this moment, and each moment you are invited to show up to. You’ll receive it over and over again, but until you accept and honor the invitation to show up and notice your life, it will pass right by. Make the moments count with your extraordinary presence. What makes you smile or laugh so hard you cry? When was the last time you smiled from a place of real joy instead of smiling to make people think you are ok? Make time and space for joy. Read books that lift your heart. Spend time with people who support you and love you like crazy. Participate in heart-swelling activities and marvel in the joy. You can’t hear what you really want or need when you are constantly surrounded by noise. Separate yourself from people, digital devices, and all incoming information and listen. Trust what you hear. Be open to learning and ready for the answers to produce more questions. Be curious about your life, the world, problems, solutions, and anything that deserves your interest. Always keep giving. Give time. Give money. Give sandwiches. Give love. Always keep giving. Dump the comparing and competing, and what you or others think you should be giving. When you give from a true desire to serve, you’ll make the biggest impact. Most importantly, let’s hold on to each other. We have to hold on, lift each other up, comfort one another, and slow down long enough to be present and witness the magnificence around us. Hold on gently and thoughtfully. Be kind. 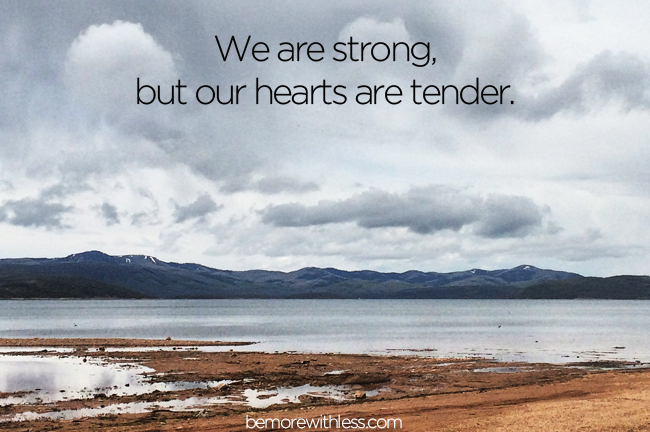 We are strong, but our hearts are tender. Hold on by embracing, nurturing, sharing and honoring these precious things. Let go to be light, and then hold on for a dear life. Once again, you have summed up so much in such powerful words. I like you have acknowledged that there are things (things? – ideas?) that we should hold on to as we let go of so much else. Otherwise, what are we creating room in our lives, hearts, minds and souls for, if it is not for what really matters to be able to fill us up? Thanks for sharing! I really enjoyed this post. What a good reminder of what’s so important in life. Like it a lot. Will definitely link. So beautiful > the idea of holding each other! Thank you for sharing this! I needed to hear (read) it. The part about being present particularly resonated with me. We all benefit when we devote some of our precious time and resources to take care of ourselves and live more intentionally. Loved this post. Thank you as always! You always seem to give me such clarity. A good list; I try, I try but I know I don’t always make it there….. Thank you for such wonderful words which have come at just the right time for me. Hurray for Radical Self-care! I should print this up to hang in my office. Truly inspiring. You touch souls of many people through your words. When I read your articles, I feel like I am having a moment of peace which I want to carry for entire day.